Black, beady eyes, furry, spindly legs and flailing claws adorned with tufts of fine hair provide diners with plenty of hairy moments each autumn in China. These aren't some far-fetched Halloween ghouls but 'da zha xie' or hairy crabs - a seasonal delicacy that makes their appearance during the cooler autumn and early winter months in the populous continent. Also known as big sluice crabs or mitten crabs, these greenish-grey creatures are so highly-prized by Chinese gourmands for their rich roe that demand has far outstripped supply for years. Those that hail from East China's Yangcheng Lake and Lake Tai are said to command triple the market price but you'd need to ensure they're the real McCoys. Due to rampant counterfeiting (yes, even for crabs! ), the originals come with plastic ID tags to certify their authenticity. 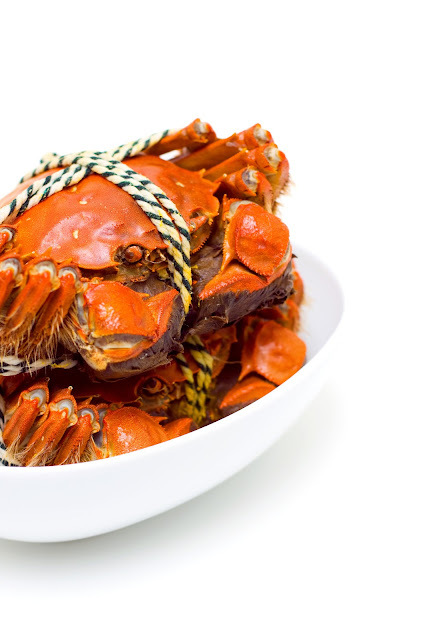 However, it's not a fail-safe method as vendors are known to transplant crabs from other lakes and let them frolic in the actual Yangcheng Lake for a brief spell (ranging from three months to two weeks) prior to export or sold domestically, hence they're known as 'xi zao xie' or shower or bathing crabs. Yet such practices haven't dampen enthusiasm for hairy crabs a bit. Most of the crabs are now bred and harvested on contract; it takes two years for mature crustaceans to be market-ready. The palm-size crabs are exported live and has to be kept inside temperature-controlled chillers to ensure their freshness. Executive Chinese chef Thian Taik Yong of Di Wei Restaurant, Empire Hotel Subang informed us that the crabs are immersed in ice-cold water twice daily for about 10 minutes and checked to ascertain they're still alive. "The hairy crabs should have a glossy carapace while the underbelly should be ivory-coloured. They should be heavy to the feel. Those with round belly denotes female crabs." At Di Wei, the waitstaff does most of the tedious work of prying open the Steamed Hairy Crabs (RM88++ each, RM148++ for a pair) for you. The top shell is then placed back onto the crustacean itself whilst the legs and pincers are snipped off so that diners can pick up and devour the individual pieces. Each mouthful of the crabs' rich, orangey roe taste like a dense custard that's not unlike salted egg yolk. The meat is delicately sweet; its mild fishiness tempered by a tart dark vinegar and ginger dip. Since hairy crabs are considered cooling (yin), most restaurants serve a cup of warm ginger tea to diners as a tonic to balance the after-effects. 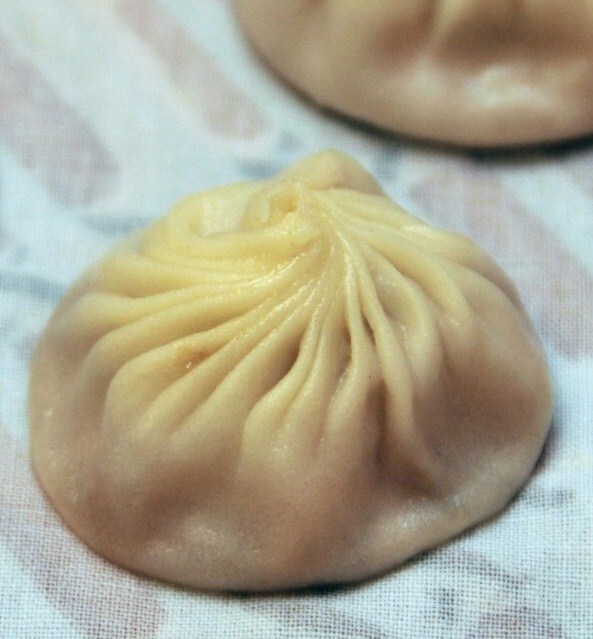 Di Wei also serves Steamed Shanghainese Dumplings (xiao long bao) with Hairy Crab Roe - delicate, dainty parcels of soup-filled pouches stuffed with minced pork and crab roe. For the impending year-end festivities that herald the months of November and December, Chef Thian has another treat in store: Rock Salt Baked Chicken (RM68.80++ each). Those who spend RM60 and above on a la carte orders stand to land a better deal as it will only cost RM28.80++. An updated version of the traditional favourite of Beggar's Chicken, the 28-year old chef decides that the offering could do with better presentation and some dramatic flair; to enhance one's dining experience and add to the merriment of diners' year-end revelry. Hats off to Chef Thian for his painstaking efforts. First, he fries the whole cleaned chicken first to give its skin that appetising brown hue. Then he stuffs it with three types of mushroom, dried scallops and some Chinese herbs before wrapping it in greaseproof paper and aluminium foil for steaming. This partially cooks the poultry before it is encased within a fine salt and egg white crust, studded with cloves. Once an order is received, the chef will bake the chicken for about 20 minutes. This gives the rock salt crust a lovely golden brown and for additional oomph, the whole thing is set aflame at the table with some mui kwai loh (Chinese rose wine). Whose mouth won't water once the nose catches a sniff of the fragrant sweet wine? More droolworthy aromas emerged once the layers of foil and paper were peeled back, revealing a fall-off-the-bone tender chicken with a layer of light, clear broth on top. We dug in and picked at the soft, juicy meat, marvelling at the pleasant woody herbal accent that permeated the flesh. Di Wei also serves a selection of evergreen broths such as Double-boiled Watercress and Pork Rib Soup that should provide ample succor for the city slicker's soul. Chunky pork ribs lent the sweet clear broth a nice richness whilst the mildly bitter greens are said to be good to combat an overly yang or 'heaty' body. Another signature dish is the Mushroom and Spinach Beancurd topped with assorted mushroom, a simple but scrumptious creation that has fried jelly-soft beancurd layered with blended spinach. A generous serving of viscous sauce laden with dried scallop and tiny bunashimeiji mushroom lends the dish moistness and flavour. 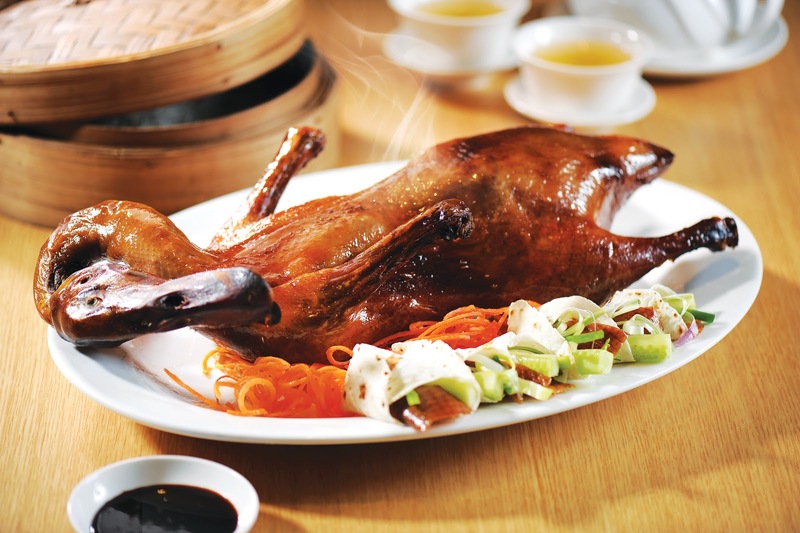 Peking Duck and dim sum rank among the outlet's highly sought-after specialities. There's always a smug, palpable sense of excitement when one managed to reel in an invite to the annual Norwegian Seafood Gala Dinner. Hosted by the new Norwegian Ambassador to Malaysia, Hans Ola Urstad, we had to battle a two-hour mega-jam to reach the Mandarin Oriental Kuala Lumpur. But heck, it was worth it the minute we clapped eyes on the spectacular seafood buffet laid out by renowned chef Frank Naesheim and his team. Imagine all the seafood you can eat, flown in from Norway and presented in both Norwegian and Asian cooking styles. This includes Norwegian salmon and all its different forms, mackerel, Atlantic halibut, caviar, scallops, herring, crayfish and kingcrab. With past stints in two and three-star Michelin restaurants in France under his toque, Naesheim is known as the Salmon King in Asia and the brainchild behind Snorre Food Pte Ltd, importer of quality Norwegian seafood. On this evening, he and his battalion of chefs tirelessly whipped up a feast for attendees, from pan-fried scampi to seared salmon for everyone's enjoyment. It was a well-orchestrated show of skills and cuisine until we were stuffed to the gills from the surfeit of stupendous seafood. The dinner was also held in conjunction with the Malaysian Norwegian Business Council (MNBC) Innovation Award as recognition to an outstanding member of the council for its excellent performance and contribution towards increasing business, technology transfer and cross-cultural understanding between Norway and Malaysia. feather in Det Norske Veritas Malaysia (DNV)'s cap to mark its 30th anniversary in Malaysia. DNV is a global provider of services for managing risks; an independent foundation with the purpose of safeguarding life, property and the environment especially in the maritime and energy sectors. Popular singer and actress Adibah Noor had the capacity crowd eating out of her hand the minute she stepped into the limelight, rendering a catchy repertoire of soulful ballads and uptempo numbers. In sync with its legendary namesake, Amadeus Bistro & Wine Bar sets out to marry music with food and wine, to heighten the pleasurable wining and dining experience for its patrons. Modelled after modern Viennese bistros of Wolfgang Amadeus Mozart's birthplace, the 2-month old outlet is run by the Croatian owner behind the famed Dubrovnik restaurant in Solaris Mont Kiara. Discerning diners will find an ample selection of classical European offerings worth warbling over, complete with latter day presentations of course. Its Duck Terrine is one such example; the dense, rich and velvety slices studded with pistachios and complemented by a refreshing side salad will have you breaking out in song. High on my list is the simple but oh-so-rustic Grilled Capsicum with Onions and Aubergines Bruschetta that are adorned with crumbly bits of feta. Light on the palate yet flavourful, the toasty slices are incredibly addictive! We also had Baked Mussels that were tender and toothsome to the bite, topped with tomato coulis and creamy cheese and wine sauce. A definitive evergreen chart-topper. Souping up our dinner was an incredibly hearty Mushroom Soup - the fungi's inherent woody nuance caressing our tastebuds with gusto, thanks to the broth's dulcet creaminess. Pasta perfect dishes include Seared Salmon with Spaghetti, al dente pasta prettied up with a slab of crisp seared salmon fillet and cherry tomato halves, and the inevitable can't go wrong Seafood Fettucine. More meaty performances to set you drooling include the Duck Confit, Lamb Rack and Prime Beef Rib. Served with buttered rice, we couldn't help but sing praises of the fall-of-the-bone tender duck. The lamb rack hits all the right notes with the creamy mash acting as a complementary canvas to flaunt the meat's subtly smoky gaminess. Redolent with rich tomato accent, the beef rib rocks us with its deep-seated flavour and fork-tender texture. Dessert that takes the cake includes Red Velvet, Carrot Cake and Cheesecake with Lemon Custard. Despite their richness, the heavenly slices were surprisingly feather-light with just the hint of sweetness. Best of all, prices here are unlikely to give you a heart attack; wines start from RM19 per glass, starters - RM17 upwards, mains - RM22 onwards and pasta - RM20 upwards. If food is the music of love, I'd say play on!